JNN 26 June 2014 Cairo : Egypt has barred three private Iraqi TV stations from its main satellite system, the broadcasting regulator said on Tuesday, after Baghdad complained that their coverage was stoking sectarian tensions. Al-Baghdadia, al-Rafidain and al-Hadath TV stations were all barred from the state-owned Nilesat, which broadcasts across the Middle East and North Africa, the head of Egypt’s broadcasting regulator Free Zone said. The channels have covered the onslaught by Wahabi Terrorist group Islamic State in Iraq and Syria extensively and carried statements from the al Qaeda offshoot. An official at Free Zone, speaking on condition of anonymity, said the decision to block the channels was linked to complaints from Iraq. The regulator’s head, Abdel Moneim al-Alfy, said: “al-Baghdadia and al-Rafidain channels were taken off Nilesat for violating their contracts with the Free Zone authority regarding their content.” He did not directly link the decision to Iraq’s complaints. “We have received complaints from the Iraqi government about the channels’ contents and are investigating them now, that is all I could say so far,” al-Alfy said. He said al-Hadath’s permit had expired. 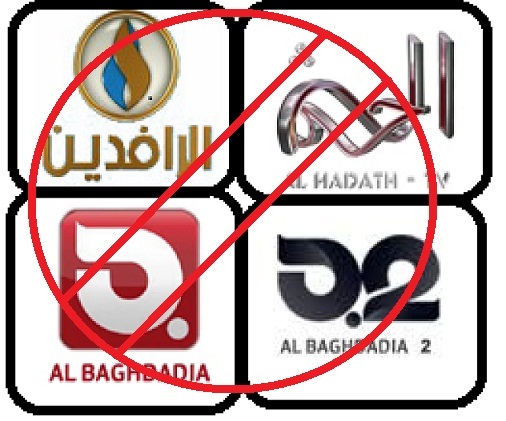 Al-Baghdadia confirmed it was now banned in Iraq and Egypt while al-Hadath’s CEO Ayman Khalid said his channel’s closure was temporary and over a financial dispute with Free Zone. al-Rafidain could not be reached for comment. Egypt has shut down a number of pro-Islamist channels since the army’s ouster of Islamist President Mohammad Mursi last year. On Monday it triggered an international outcry by jailing three journalists from Qatar-backed Al Jazeera television, accusing them of aiding Egypt’s outlawedIslamist Muslim Brotherhood. This entry was posted in AFRICA and tagged Al Hadath TV, Al Jazeera, Al Rafdain, baghdadia, Egypt, Iraq, Iraqi TV, Nile Sat, TV Channels. Bookmark the permalink.